I started online turfgrass discussion forums in 1997 on floridaturf.com now owned by Turfgrass Producers of Florida. After moving to Turfgrass.com in 2001 and converting to WordPress in 2016, Turfgrass.com continues to serve as a platform for open, public discussion of turfgrass problems and management. Turfgrass.com is owned by Phil Busey Agronomy Consulting Inc. which provides Turfgrass.com as a public service. We learn the right things by reading books. We learn things well by making mistakes and hopefully remembering bad situations so we can prevent them in the future. Somewhere between these extremes is an additional way of learning: Ask a question about a problem, and study the answers. It is amazing how deep your knowledge will grow from questions and answers, at less expense than trial-and-error. You are on the road to be an expert problem solver. You may go beyond to ask more questions just because you are curious. Not just to solve problems, but to understand how things work. Becoming a lifelong learner is both productive and fun. After getting practical experience, if you go to textbooks, you may see knowledge in a new and clearer light. There is not one path to turfgrass knowledge, but a combination of paths. I think questions and answers are at the core of what we do. So the role for Turfgrass.com is questions and answers, open public discussion, tempered with organization, accessibility, rigor, and common sense. Register to ask a new question or “Post” or comment on someone else’s question. Next, login. Create a new Post. Give it a good Title and insert keywords into the tags to help interested people find your Topic. The Golden Rule is, “Listen to others as you would have them listen unto you.” Listening to others means staying on topic, not blatantly trying to sell stuff, and being nice. Occasionally, I send newsletters to Members on the Turfgrass Management list, to announce events and helpful information, largely non-commercial. If you don’t want newsletters, hit unsubscribe, and you can still post, reply, and comment. You can turn on or off followed threads through your Member settings in the upper right. To logout or make changes, click the “Gravatar” in the upper right. That is the gray box with a silhouette unless you personalize it with your own image. In the 1970s, I knew a turf extension specialist who plastered his office door, top to bottom, with pink “While you were out” messages. In that century people communicated across distances using an early audio instrument attached by a cord to the wall. Before this device disappeared it was called a “landline.” Throughout most of 1900s the mechanical “answering machine” did not exist. Instead, a human secretary answered for the extension specialist, said that he was out, and wrote a note of the time and subject of the call, and the caller’s name and “telephone” number. When I was writing the Turf Q & A column, the internet was young, a seeming flood of information, like “drinking from a firehose.” Despite all the computer books, it was hard to find and remember the answers I needed on all my questions about computers. The pre-Google search engines Altavista, Excite, Hotbot, and Lycos helped me find the answer from sharing communities. More importantly, I gained and retained the knowledge. Active problem solving is a good way to learn about computers as well as turfgrass. Socrates asked questions of his students and engaged them in dialog to develop deeper understanding. This was developed further in the Dialogues of Plato. The human brain learns well in playing games, solving problems, and answering questions. Besides the Socratic Method, I think there is value in linear narrative, particularly in science. But I’m getting nonlinear. 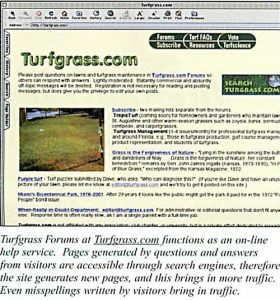 Turfgrass Forums 2002, in an article, “Web marketing of turf: Beyond the electronic bulletin board” which showed the primitive state of sod web sites. In 1997 I asked my University of Florida turfgrass students to post questions and answers to the floridaturf.com website. I also started Turfgrass Management as an email list for turfgrass industry people mostly in Florida. The vast majority of workers in the lawn and landscape industry and gardeners and golf course superintendents did not then have email addresses. But folks were getting online. Eventually everybody got “wired.” In 2001, I moved web pages to turfgrass.com and used an early flat-file perl version of Infopop Universal Bulletin Board (UBB). For a dozen years there was lively conversation, with over 22,000 posts and replies. The Death of Discussion Forums? Times changed. Again. Everybody got mobile. And unwired. Inappropriate forum posts required deletion. Facebook and twitter grew and competed for online attention. Turfgrass.com postings screeched to a stop. The incredible shrinking Turfgrass Forums was part of a trend, the internet version of “bowling alone.” I still think there is value in the ancient idea of an open public forum involving directed conversation. So the intention of renovating turfgrass.com is to provide Q & A, original content, and raw material for knowledge-base solutions to problem solving. What I mean by that is still fuzzy, is partly encyclopedic, and partly goes back to my inspiration of artificial intelligence problem solving from University of Illinois’ Dr. Tom Fermanian, an early promoter of expert systems and machine knowledge in turfgrass, and others such as Dr. Jim Beard who literally wrote the book on turfgrass science. All this should be better organized! Stay tuned!